The ride is sponsored by the Florida Off-Road Cycling Enthusiasts (F.O.R.C.E.) The phone number is 561-684-8444. tom@thebicyclery.com is listed as the email contact. 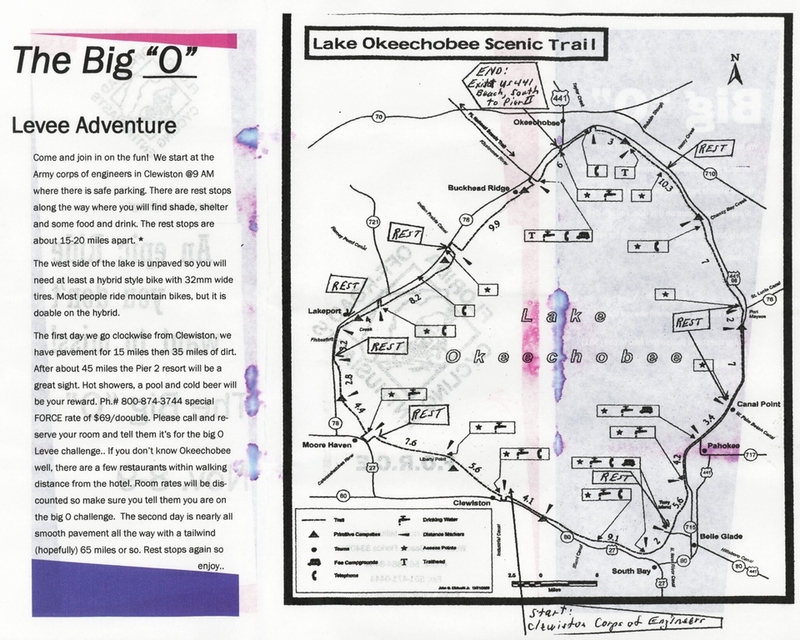 I’ve been riding the Lake Okeechobee Scenic Trail (LOST) for going on five years now. It’s one of my favorite places. I have to confess, though, that I stay on the paved path on the top of the dike or drop down to the highways. Even though I have 32mm tires, I don’t think I want to ride the ruts and shell rock on the top of the dike. Come and join in on the fun! We start at the Army Corps of Engineers in Clewiston at 9 A.M. where there is safe parking. There are rest stops along the way where you will find shade, shelter and some food and drink. The rest stops are about 15-20 miles apart. The west side of the lake is unpaved, so you will need at least a hybrid style of bike with 32mm wide tires. Most people ride mountain bikes, but it is doable on a hybrid. The first day we go clockwise from Clewiston. We have pavement for 15 miles, then 35 miles of dirt. After about 45 miles, the Pier II resort will be a great sight. Hot showers, a pool and cold beer will be your reward. Phone number 800-874-3744. There will be a special FORCE rate of $69 for a double. Reserve your room and tell them it’s for the Big O Levee Challenge. There are resturants within walking distance from the hotel. The second day is nearly all smooth pavement all the way with a tailwind (hopefully). Rest stops again, so enjoy. You can find aerial maps with trailheads marked on them here. They won’t match up exactly with the Big O map, so you should use their map for this ride. You’ll see plenty of wildlife. I’ve seen gators every time I’ve been on the LOST. The Look, Don’t Touch Rule is very much in effect. Since I’m a road biker, like I said before, I take 78 along the west side of the lake between Moore Haven and Okeetanta. It’s been paved within the last couple of years, has wide shoulders and low traffic. It’s also not exposed to the wind like riding on the dike if you hit a killer headwind. You’re also not the highest thing around if lightning is in the area. Matt, my son, and I rode 98 between Port Mayaca and Pahokee at the end of last year. The road was under construction then, but it wasn’t as bad as we had feared. It may be finished by now. If it is, it’ll have good shoulders. The dike was undergoing construction between that area, so I don’t know if it’ll be open even for the Big O ride. Have fun. (I’ve passed on all the info I have about the Big O ride. If you want more detail, contact The Bicyclery. I can vouch for the ride along the top of Lake O’s dike. It’s simply a great ride — and there’s always something to see. No shade unless you count man-made park benches with skimpy roofs over them. No water or “facilities” unless you leave the dike and get on the highway. For those fearful of the gators — nah. You’d have to ride down to them at the lake rim or canal bank. I’ll grant you it is weird to hear the bulls roar during mating season. And if you have a flashlight, to shine it out in the water or sawgrass and see their red eyes all over the place — spooky! Bwah-hahahaha….Just don’t hit a rock and go soaring down the bank. Snakes — that’s a whole other story. Especially in winter, you’ll see snakes — lots of them up on the paved dike, sunning themselves. And armadillos — in droves. They are everywhere at dusk and even at night along the trail. For birders, this is heaven, especially in fall and spring when the mass migrations take place. Bet you never associated “Palm Beach” and anything like this; but the posh island is a mere 40 miles away, due east. What a contrast.